Kick off your visit on the 13th (Sat): get to know the fascinating history of Eastbank Esplanade and then look for all kinds of wild species at Oaks Bottom Wildlife Refuge. 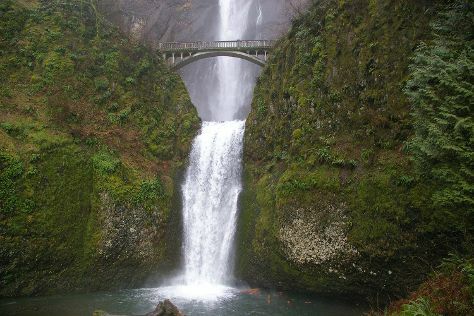 On the next day, steep yourself in history at Pittock Mansion, admire nature's wide array of creatures at Oregon Zoo, and then take in the dramatic scenery at Multnomah Falls. To see ratings, traveler tips, and more tourist information, refer to the Portland trip itinerary website . Washington DC to Portland is an approximately 8-hour combination of train and flight. You can also fly; or drive. The time zone difference moving from Eastern Standard Time to Pacific Standard Time is minus 3 hours. Traveling from Washington DC in April, you will find days in Portland are a bit cooler (63°F), and nights are about the same (45°F). Finish your sightseeing early on the 14th (Sun) to allow enough time to travel to Timberline Lodge. Kick off your visit on the 15th (Mon): take in the awesome beauty at Timberline Lodge and Ski Area, then explore the striking landscape of Mt. Hood National Forest, and then take in the dramatic scenery at Little Zigzag Falls. Plan trip to Timberline Lodge with our itinerary maker to find out where to go and what to do. Traveling by car from Portland to Timberline Lodge takes 1.5 hours. When traveling from Portland in April, plan for little chillier days and about the same nights in Timberline Lodge: temperatures range from 58°F by day to 43°F at night. Finish your sightseeing early on the 15th (Mon) to allow enough time to travel to Cannon Beach. Cannon Beach is a city in Clatsop County, Oregon, United States. On the 16th (Tue), enjoy the sand and surf at Cannon Beach, explore the striking landscape at Haystack Rock, and then admire all the interesting features of Astoria Column. On the 17th (Wed), you'll have a packed day of sightseeing: kick back and relax at Manzanita Beach, immerse yourself in nature at Ecola State Park, and then look for gifts at Bronze Coast Gallery. To find where to stay, other places to visit, reviews, and more tourist information, you can read our Cannon Beach trip itinerary planning app . You can drive from Timberline Lodge to Cannon Beach in 3 hours. April in Cannon Beach sees daily highs of 58°F and lows of 43°F at night. Finish your sightseeing early on the 17th (Wed) to allow enough time to drive to Seattle. 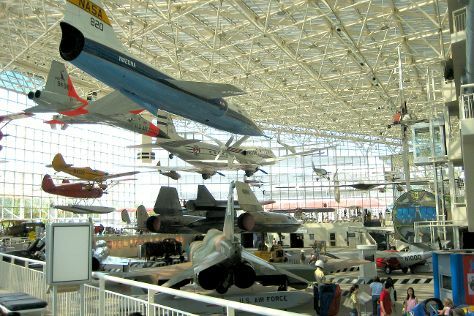 Start off your visit on the 18th (Thu): see the interesting displays at The Museum of Flight, then admire the masterpieces at Chihuly Garden and Glass, then make a trip to Space Needle, and finally shop like a local with Pike Place Market. Keep things going the next day: take in the exciting artwork at Glasshouse Studio, wander the streets of Pioneer Square, then visit a coastal fixture at West Point Lighthouse, then take a leisurely stroll along Hiram M. Chittenden Locks, and finally pause for some photo ops at Fremont Troll. To see more things to do, other places to visit, reviews, and tourist information, use the Seattle vacation planner. You can drive from Cannon Beach to Seattle in 4.5 hours. Alternatively, you can do a combination of bus and flight; or take a bus. In April, daytime highs in Seattle are 61°F, while nighttime lows are 46°F. Wrap up your sightseeing by early afternoon on the 20th (Sat) to allow time for travel back home.